Welcome to Our Page on Lagoa. When you wish to return to our Homepage please Click below. 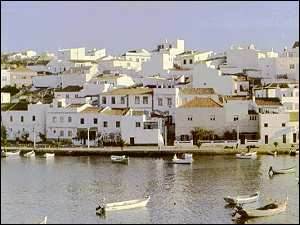 Introduction.This is one of the most attractive towns and municipalities of the Central Algarve Region.The town itself is situated slightly inland but the entire municipality covers a large area and numerous lovely beaches.So this is one town to give considerable attention to when looking fo a hot sunny beach oriented holiday. View Larger MapAs you can see it is nicely situated for Faro airport,approx' 30 minutes.So not to many cries,"are we nearly there yet". You are also not too far from the nightlife of Albufeira.So a pretty usefull tourist town well positioned to give variety. The population of the Municipality of Lagoa is reckoned to be some 20,0000 people. This area has plenty of good hotels,restaurants,hostels,villas,apartments and even country houses to make your choice of rental property.Just about every type of holiday can be configured in this area. There are numerous great beaches in this area and it is known as a place for hot sunny beach holidays.Beaches include Praia Grande,Praia Nova,Praia Barranco and one to definitely visit is Praia do Carvoeiro.You will not run out of beaches to visit as long as you have a car.Definitely recommend hiring a car for beach holidays in this area. Lagoa is certainly not short of things to do.Obviously the No1 "todo" is Beaches as already mentioned above.However another great family attraction is Aqualand Splash & Slide a very well loved water theme park.This could easily take up two days if you can afford it! Completely different in attractions is Trilhos do Algarve a natural and wildlife park,which is also very popular for passing the time. Another is called ProRent Algarve which is Quad biking.Hiring of quad bikes for stimulating fun.You can also charter boats and take coastal boat trips which can also include visiting the numerous cliff caves in the region. On a more cultural level trips to the famous church of Iglesia Matriz do Lagoa is well worth booking to visit.Another popular attraction for cultural interest is the Convent of Nuestra do Carmo.You will find plenty more if this is your major interest. So often in the Algarve the big attraction can be golf courses and there are many well known high quality courses for you to trial in this very attractive region. Of course on the subject of sports you can find lots in the way of watersports such as windsurfing and sailing.Where you have chosen to stay will of course have plenty of information on all the activities in the Municipality and will give you guidance and direction. This really is just a general overview so you know what sort of activities and places to visit are available if you are considering staying here.